/ Data storytelling pt.1: The essential data science skills everyone needs. Once your business has started collecting and combining all kinds of data, the next elusive step is to extract value from it. Your data may hold tremendous amounts of potential value, but not an ounce of value can be created unless insights are uncovered and translated into actions or business outcomes. During a 2009 interview, Google’s Chief Economist Dr. Hal R.Varian stated, “The ability to take data—to be able to understand it, to process it, to extract value from it, to visualize it, to communicate it—that’s going to be a hugely important skill in the next decades.” Fast forward to 2016 and many businesses would agree with Varian’s astute assessment. As data becomes increasingly ubiquitous, companies are desperately searching for talent with these data skills. LinkedIn recently reported data analysis is one of the hottest skill categories over the past two years for recruiters, and it was the only category that consistently ranked in the top 4 across all of the countries they analyzed. Interestingly, much of the current hiring emphasis has centered on the data preparation and analysis skills—not the “last mile” skills that help convert insights into actions. Many of the heavily-recruited individuals with advanced degrees in economics, mathematics, or statistics struggle with communicating their insights to others effectively—essentially, telling the story of their numbers. 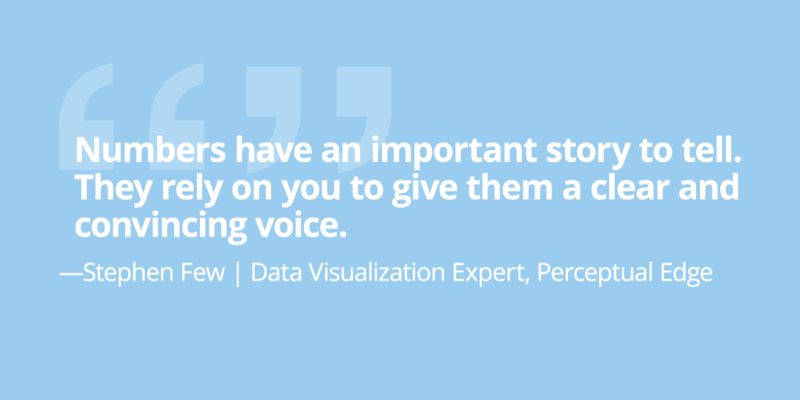 The need for more data storytellers is only going to increase in the future. With the shift towards more self-service capabilities in analytics and business intelligence, the pool of people generating insights will expand beyond just analysts and data scientists. This new breed of data tools will make it easier for people across business functions to access and explore the data on their own. As a result, we’re going to see an unprecedented number of insights being generated within companies than ever before. However, unless we can improve the communication of these insights we will also see a poorer insight-to-value conversion rate. If an insight isn’t understood and isn’t compelling, no one will act on it and no change will occur. Data visualization expert Stephen Few said, “Numbers have an important story to tell. They rely on you to give them a clear and convincing voice.” Any insight worth sharing is probably best shared as a data story. The phrase “data storytelling” has been associated with many things—data visualizations, infographics, dashboards, data presentations, and so on. Too often data storytelling is interpreted as just visualizing data effectively, however, it is much more than just creating visually-appealing data charts. 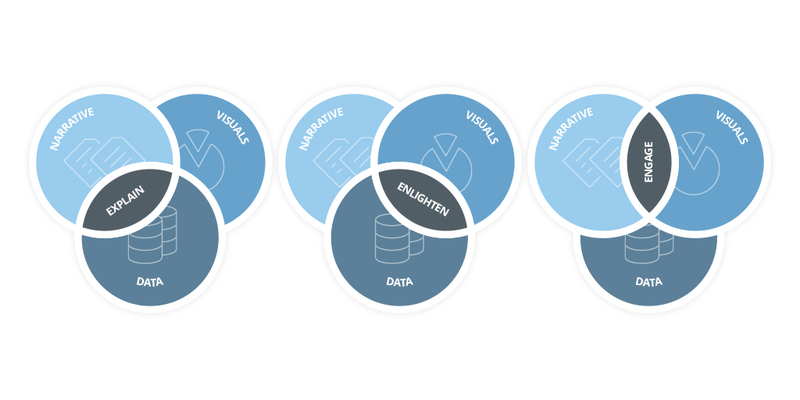 Data storytelling is a structured approach for communicating data insights, and it involves a combination of three key elements: data, visuals, and narrative. It’s important to understand how these different elements combine and work together in data storytelling. When narrative is coupled with data, it helps to explain to your audience what’s happening in the data and why a particular insight is important. Ample context and commentary is often needed to fully appreciate an insight. When visuals are applied to data, they can enlighten the audience to insights that they wouldn’t see without charts or graphs. Many interesting patterns and outliers in the data would remain hidden in the rows and columns of data tables without the help of data visualizations. Finally, when narrative and visuals are merged together, they can engage or even entertain an audience. It’s no surprise we collectively spend billions of dollars each year at the movies to immerse ourselves in different lives, worlds, and adventures. When you combine the right visuals and narrative with the right data, you have a data story that can influence and drive change. Tune in next week for Brent’s followup on the importance of data storytelling in your business. And if you’re ready to start finding the story behind your numbers, Domo can help. Learn more about how you can uncover hidden opportunities and optimize your business in real time using Domo. **This article was originally published on Forbes.com March 31, 2016.